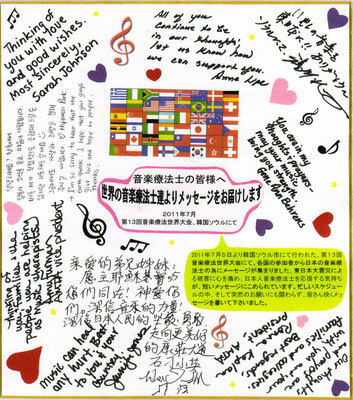 Kakehashi” Music Therapy Connection Group was established on June 6, 2011, after the Great East Japan Earthquake which occurred on March 11, 2011. 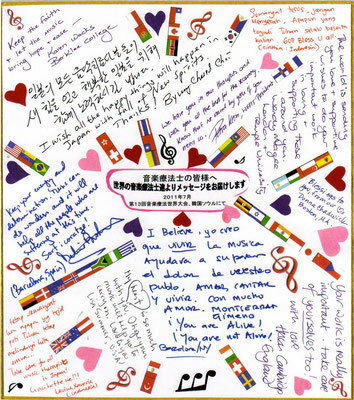 Three Japanese music therapists who lived in Japan and the US were involved in the disaster relief activities which included providing communications as translators between American music therapists and Japanese music therapists immediately after the earthquake happened. Since they were willing to a provide long-term support to the Japanese music therapy community, they co-founded the “Kakehashi” Music Therapy Connection Group which is committed to creating global access to music therapy by connecting clients, professionals, and organizations as well as supporting Japanese music therapists and students. For the past 4 years, we have been providing workshops and lectures for professional music therapists, music therapy students, and people who are in the related field in Japan.We also provide monthly newsletters, the online resource room, and the quarterly online peer support meetings via Skype as membership benefits. 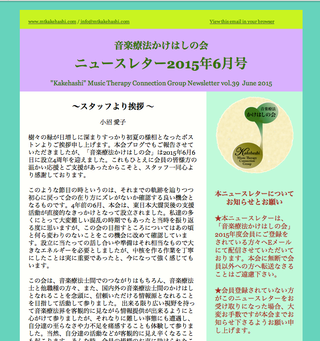 The monthly newsletter includes the selected latest music therapy news from around the world and the Kakehashi Column which considers the music therapy related topics with multi-perspectives. The online peer-support meeting has been creating a support system for the members and the staff. In 2013, we were approved as a CEMT provider as the very first organization outside of the US. In 2014, we were approved as an official JMTA (Japanese Music Therapy Association) Seminar Provider as well. ← A photo of the first page of our monthly newsletter vol.39. It is sent to the group members via email as a membership service. The newsletter contains greetings from the staff, latest music therapy news from around the world, music therapy columns, and more. 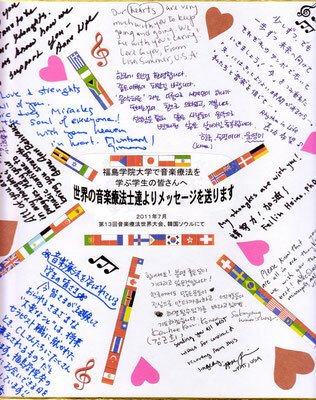 ↑At the world congress of music therapy in Seoul, South Korea in July 2011, we gathered messages from music therapists around the world for the Japanese music therapists after the country was devastated by the great earthquake on March 11, 2011. Two of the message boards were donated to the JMTA (Japanese Music Therapy Association), and the last one was donated to the music therapy students who studied at Fukushima College where is close to the Fukushima- Daiichi nuclear power station. We usually write our blog in Japanese language and will write some in English in future. At this point, We have one article which is written in English. Please check it up!